The 386 has been through many inversions since its inception in 1991, although its terminals do appear to have settled down in more recent times, with the focus of attention seemingly having switched to service enhancements. While the original route does have some sections common with the present service, many of these were served or linked differently compared with today. The number derives from the established 286, as the 386 broadly followed that route between Eltham and Greenwich (District Hospital), but taking a more scenic route via many previously unserved roads. On arrival at Well Hall Circus the route did an unexpected left back along Westhorne Avenue, giving Westhorne Avenue residents a link to and from Eltham town centre, and then ran along Hornpark Lane and Weigall Road. Due to unavailability of a right turn into Hornpark Lane from Westhorne Avenue, buses in this direction ran along Abergeldie Road. The 386 thus arrived in Kidbrooke, where it proceeded over the now infamous railway bridge and then onto the old Rochester Way, thus alongside 286s going back to Eltham, and only a mile from where the bus would have been a quarter of an hour previously. However, it soon turned off again to run via the Brook Estate running along Woolacombe Road, Dursley Road, Holburne Road and Corelli Road to Shooters Hill Road. It then provided a link from this area to the Royal Standard at Blackheath, with another short addition to road coverage in the shape of Old Dover Road. Instead of following other routes, including the 286, down Westcombe Hill, the 386 then ran via Westcombe Park Road and then in a loop via Vanbrugh Hill (passing the hospital), Trafalgar Road and Maze Hill. The service ran half-hourly, with no evening or Sunday service. New Optare Metrorider minibuses from Plumstead garage were used, in common with the 380, later joined by some assorted Mercedes 811Ds. Closure of the railway bridge at Kidbrooke station to buses in 1992 caused a lengthy diversion and made the route really unviable in its existing form. So from 22 May 1993, the lightly used section between Eltham and Kidbrooke was discontinued, and the route diverted to a slightly more useful objective at Woolwich. Brook Estate was now served the other way, as buses from Greenwich turned into Weyman Road and then served Wricklemarsh Road, a different section of Woolacombe Road and then Dursley Road, Holburne Road and Corelli Road as before. It was then right onto Shooters Hill Road, Academy Road, Woolwich Common, Herbert Road and Nightingale Place, into Woolwich town centre and terminating at Plumstead garage. An evening service was added, and the service was extended to Greenwich town centre, now serving Vanbrugh Hill in both directions, but not Maze Hill. 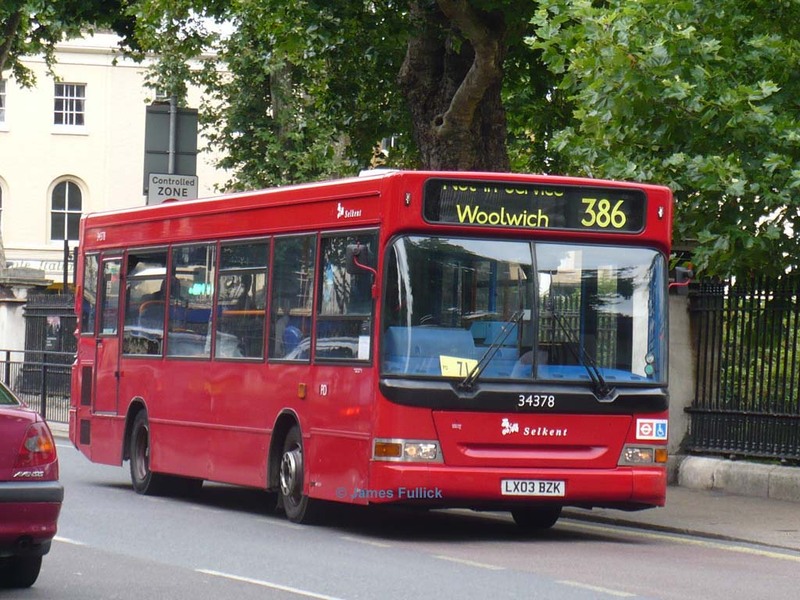 However, the revised route was a bit tight to run with 3 buses so, to aid reliability, from 2 July 1994 the section of route between Plumstead garage and Woolwich town centre was reduced to garage journeys only, when the bus needed a change of drivers. In 1997, the Optare Metroriders were replaced by a batch of new Mercedes Benz Varios with Plaxton Beaver bodywork. Opening of the Queen Elizabeth Hospital in 2001 caused a round of genuine improvements from 24 February. The service was diverted via the grounds of the hospital (incidentally causing it to serve Ha-Ha Road/Woolwich Common junction twice on each journey), but as this again made the timetable rather tight, the frequency was increased to every 20 minutes, increasing the round rotation time from 90 to 100 minutes, with 5 buses. A half hourly Sunday service was added as well, and new low floor buses were introduced. Later, the Monday to Saturday daytime frequency was further increased to every 15 minutes. The next change, on 10 February 2007, made the route even more confusing. There had been calls for years for a direct link between Greenwich and Blackheath village, and route 228 was proposed – coincindentally, this would also have served the Horn Park area formerly covered by the 386, though possibly the part now served by the B15. The route was tendered, but not awarded as "costs were too high" – presumably because it would have been difficult to operate from any of the existing companies’ garages, all some distance off the route. 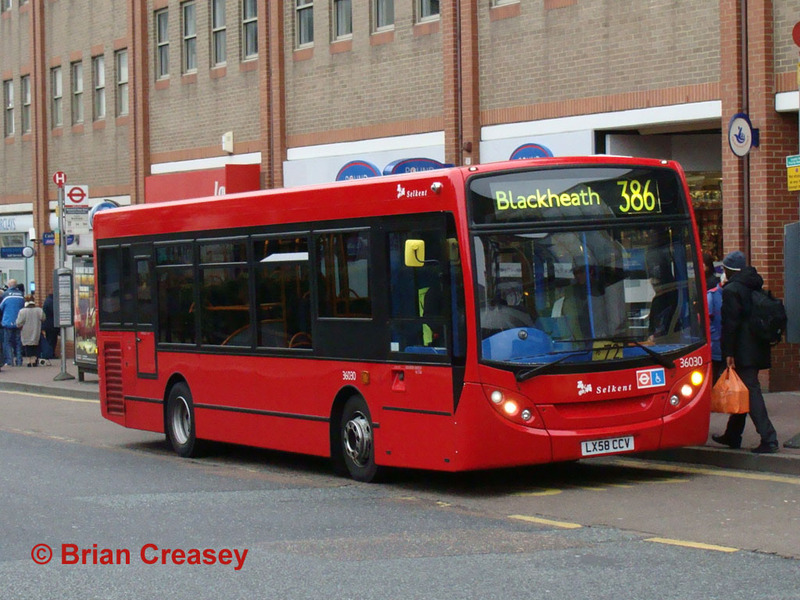 Instead, the key link was provided by extending the 386 – but remember the route has already served the other end of Blackheath on its way from Woolwich to Greenwich! From Greenwich buses operate via South Street and Blackheath Hill; the awkward road layout on the Heath, designed to stop rat-running, has lead to a one-way operation to and from Blackheath Village. A new contract began on 31 May 2008, incorporating an increased evening/Sunday service (every 20 minutes) and also calling for new vehicles. There was some delay putting these buses on the route – they were initially put on route 291 instead, apparently because they were fitted with the new iBus control system, which was not yet live at Plumstead garage, and the 291 was deemed easier to operate without radio control – until some diversions commenced around Queen Elizabeth Hospital! One of the new vehicles is depicted above, 36030 (LX58 CCV), a short Enviro200 Dart "integral" from Alexander Dennis, at Woolwich Arsenal Station on Saturday 1 November 2008. The blind display of "Blackheath" is singularly unhelpful given that the route passes through that general area twice on each journey – a local correspondant had persuaded TfL to change the display to "Blackheath Village," and this has been included in the blind displays on the new buses, but they are generally not using it, and TfL are now denying they agreed to change it! However, after London Travelwatch intervened it was agreed that the blinds will be changed to Blackheath Village, but not until new ones are required. The iBus announcements have already been changed. Some of the older Darts linger on, and there is bound to be mixing of buses with the 291 for the forseeable future. The example featured previously has now left London, so I am taking the opportunity to replace it with 34378 (LX03 BZK), like the earlier picture taken on Wednesday 20 August 2008 when the photographer was doing a tour of the route. These buses are slightly longer at 9.4m, being the older Dart SLF model with Plaxton Pointer bodywork. The previous "official" allocation on the 386, prior to the Enviro200s, was of similar buses from a batch originally intended for route 124. Unfortunately, the new contract has reverted to smaller buses, which still meet TfL's capacity requirements. Further revisions took place in February 2010 to simplify the routeing in the Woolwich Common area and speed up journeys to and from Woolwich, in conjunction with the Docklands Light Railway extension to Woolwich Arsenal and the re-design of Woolwich town centre. From Herbert Road buses take the more direct routeing via Sandy Hill Road/Burrage Road, while the 244 took over the section via Nightingale Place; these changes stop the 386 serving the Ha Ha Road junction twice!